A piece of worked bone? Nope – it’s not vegetable based. Definitely something fishy about this one…maybe fishy and pelvic? Not bad! Although I don’t think it’s pelvic…. I’m no expert but I’m missing the tell-tale tooth signs, aside from the obvious shape. I ask the same question as henstridgesj, piece of worked bone? You’re right – it’s not a tooth, but not wood either! from the grain, i’d say it was wood. seeing the end would help determining if it was bone or wood. was it a carved wooden tooth for a mask or sculpture? Grain in a material can be misleading! So I’m guessing not a tooth. I mean, how many animals have uni-de tidied mouths? Almost all of them have more than one tooth. Whence my distrust of the label. Plus, the broad, or base, end seems to have been carved in some what. 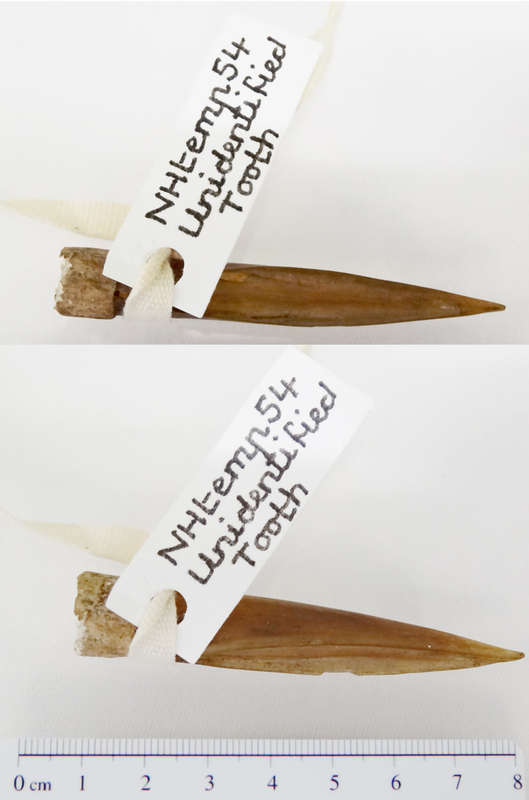 And the shape of the “tooth” itself is unlike ant tooth ever grown. But to have that grain and lustre, either it is an aged piece of ivory, or (just speculating here) it’s something else altogether! My first thought was “surely that’s wood, not bone” but if that’s the mystery object it must be animaly. So… A worked ivory dowel/peg is my best bet. But I’m really not confident in that bet and I did consider folding. Is it a dorsal barb from a skate or ray? Modified into a type of tool?